USE Together, the screen sharing app that lets you collaborate with your teammates from anywhere in the world as if you were all at the same desk 👩‍💻👨‍💻 is finally coming out of beta. USE Together online beta has been available for free for about 20 months now and it sure has come a long way. We made it a point to listen to all of you and over these months, we received quite good feedback 👍 that allowed us to improve the app considerably. From all the team, and to everyone who have been using USE Together since the beginning or have just started using it, thank you 🙏. We’re thrilled today to announce that USE Together is finally getting out of beta on Wednesday, March 20. Both of these plans will allow you to invite up to 3 guests on your screen. Only Basic users who share a screen will have the limitation. You will still be able to take control of a Pro user’s screen with a Basic plan, even if the daily limit has been reached on your account. We made it simple for teams to manage their subscriptions from one place, with centralized billing. Add, remove team members and change their plans (Basic or Pro) at anytime. Each invited team member will get the whole team added to their contact list on the app. 📹 Record the session (screen share and audio chat) to re-watch it later on. A nice feature to make instructional/demo videos and keep track of what has been said during the meeting. 🖥 A new lightweight session bar will appear on top of your screen when a session is running. It will enable you to quickly change what you’re sharing, mute your microphone, record or end the session. You’ll be able to hide it completely. 🔗 Opening a shareable link will now ask if you want to join the session from the app (instead of the web browser only) if you have it installed. Please note that starting from Wednesday, March 20, you will need to update the app to the latest 2.1 version to continue using it. You will automatically be subscribed to the 15 days Pro trial. We’ll be happy to answer any question you might have. You can reach us at [email protected]. Work does not need to be done in a specific place to be realized efficiently. Several workers clearly prefer to work comfortably from their home or anywhere they want. 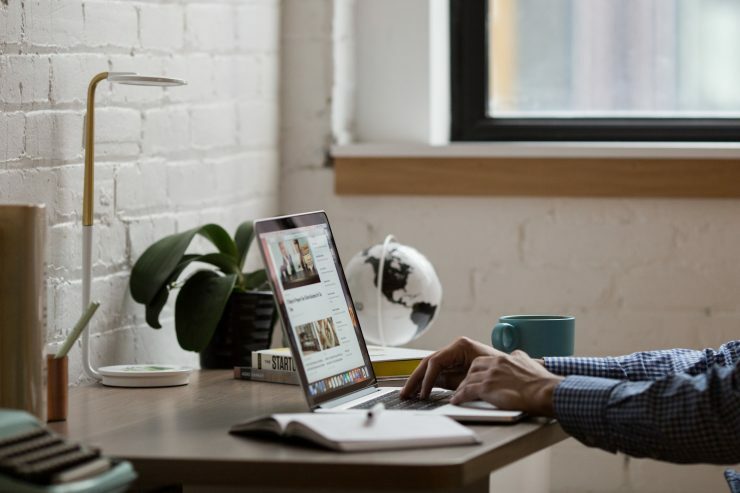 Nowadays, with the rise of new technologies and new tools, remote work (also called telecommuting) is becoming the new traditional way of working. According to recent studies, 25% of Americans work remotely few hours a week outside their office. (Source : www.smallBizTrends.com) Companies tend to allow more their employees to work away from their office. For some employers, results are actually more important than the amount of time their employees spend in their office. With the rise of Internet and communication tools, working remotely is a breeze. In this article, here are seven reasons why it is good for a business to work from home… or anywhere you want! 1. Your office is not your only workplace anymore. In our interconnected world, anything can now be accomplished with a laptop and WiFi. This connectivity allows everyone to communicate easily with their friends, colleagues, customers everywhere they want: in the train, by the sea, in the mountains and so on. Workplace should not be limited to an office in which you’re stuck all day long. Remote work allows everyone to work wherever they want, in a place where they feel comfortable and productive, without geographic boundaries. If you have children, no need for a baby-sitter, stay at home and take care of them. If you have to travel for professionals needs (or just to travel), work from home or even abroad and forget about the time zones! . Tools like USE Together give you the ability to work outside your office as you are able to work anywhere you want. All you need is a device connected to the Internet. Remote workers say that they feel more productive when working away from their office. They use flexible working hours and work when they are most productive. By working remotely, you can be your own boss and set your own schedule so you can combine work with all your personal life (family, friends, hobbies and more) and professional responsibilities. Remote workers can (and might) take few minutes breaks whenever they want. 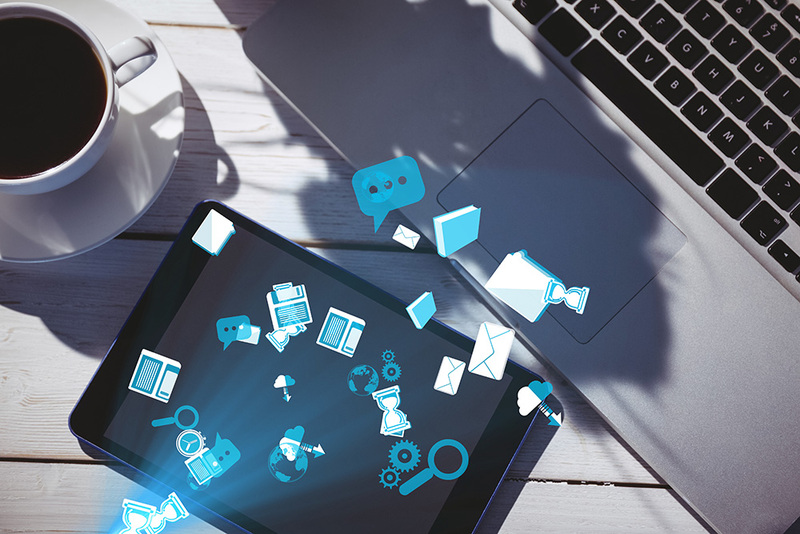 To work remotely with USE Together, all you need is a device connected to the Internet. 3. Don’t waste your time and money anymore! Working remotely also implies saving time. No more early alarm clock every morning, no more public transportation, no more driving to go to your office, no more high fuel cost… but more productivity at home! You can even take time for a breakfast! Saving time and money is a big advantage of remote work and it makes workers happier. Workers are more productive when there is less tiredness and boredom. Remote workers also cost much less for employers because they don’t have to rent an office if they don’t have the money to afford it. As working remotely implies saving time, you can thus catch up on delayed work but also have more time to focus on one task. Tools like USE Together are perfect to work with your team without moving. This way, if you happen to be stuck at home, you can still collaborate with your teammates on important projects. 4. A better communication with your team. When you’re at the office with your colleagues, you mostly talk about work with them. However, sometimes you come to have some other argues as the last Star Wars movie or the last football match. All that stuff that have nothing to do with work. Less distraction, more productivity. Remote workers are well connected and can keep in touch with their team more easily. They often need to send reports to your colleagues and you only need to communicate essential informations about work and not other subjects. Some useful management tools allows you to instantly update your work when a task is over. No useless informations anymore while you’re working on a project. This is explained by the fact that they are more organized in their work as long as there are now several tools for organizing (to do list, calendars, memos, notepads, etc.) so they can stay focused on one task. By working from home, remote workers are less distracted as long as their workplace are more quiet than an office. With USE Together, working from home with your team will help you to increase your team’s productivity and stay focused on your work as long as you’re working on the same support all together. 6. Be comfortable while you’re working. Working in traditional office requires to be presentable and well dressed everyday. Whereas, at home or in a coffee bar, you’re free to wear whatever you want (yes, even pajamas!) while you’re writing a report or coding. By working with USE Together, you don’t have to worry about the way you dress since nobody can actually see you! Plus, you can go everywhere to be in a quiet place. You can set up your own space and work from your bedroom, on your own desk or even in the couch. 7. Work remotely, work happily! Remote workers tend to be less stressed and happier than office workers. Working remotely leads to more stable work condition, a higher level of productivity and… a best quality of life. Employees won’t feel constantly the need for vacations and the absenteeism rate is lower in a remote company. Remote work increases work quality but also workers happiness because they get more involved and are becoming more and more empowered to work. That’s exactly why more and more workers choose to work with collaborative tools. USE Together is a nice collaborative tool to work remotely with your team. With USE Together, you can work wherever you want, whenever you want with whoever you want without moving. All you need is a device connected to the Internet. USE Together is a perfect tool to increase your team’s productivity and stop wasting your time. Make your workplace more comfortable and feel at ease while you’re working with USE Together! You can download USE Together on www.use-together.com. USE Together integration for Slack is now available! Today, we announce that USE Together is now available on Slack. Communication is smoother when all your tools are connected together, so you can use all your apps easily from one place. Slack is a collaboration tool that allows you to connect and communicate efficiently with your team. It brings all the communication together in just one place. Slack also lets you integrate tools like Skype, Twitter or Evernote. With Slack, you can create a workspace and invite all your teammates to join it. Your workplace is a shared hub where members of your team communicate and collaborate easily. Slack is a great tool for small, medium and big companies. On Slack, your workspace is divided into different sections: channels, messages, search and notifications. Channels: A channel is a single place for messages, tools and files shared between you and your team, organized around any subject you want. There are two types of channel: Public channels (open to your entire workspace), private channels and shared channels. Messages: You can share a message in a channel or send someone a direct message, it’s private and secure. Search: With the search field in the upper-right corner of Slack, you can quickly find all you need. Notifications: When something needs your attention, Slack warns you about it. You can receive notification on your desktop, your mobile device or by email. Slack helps teams to improve their productivity and have a better communication. First, you need to install the USE Engine app on your machine. Then, you can add USE Together to Slack. It’ super easy! USE Together is installed on your team’s workplace! How to use Slack with USE Together? Before sharing your screen with USE Together and using these commands through Slack, note that you need to have the USE Engine app v2.0.2 or later installed on your machine. You are now ready to use USE Together from Slack! If you have any question, feel free to send us feedback at [email protected]. Your feedback is deeply appreciated. We want to give you the best screen sharing experience. Happy screen sharing with USE Together… and Slack! How to get started with USE Together? First time sharing a screen with USE Together? We’re here to help! If you’re not sure where to start, you’ve come to the right place. Here are a few helpful things to know. Ready to get started? You would like to work with your team on the same machine in real time even if you’re away from them? USE Together is meant for you! USE Together is a collaborative screen sharing solution easy to use and available on both Windows and Mac. Some remote workers sometimes need to work with their colleagues even if they are not in the same room. In this case, working all together on the very same machine, on the same project, at the same time, instead of using several different machines, can increase greatly your productivity. Everyone can thus modify a document simultaneously on a same virtual workplace. No need to send it over and over again each time your team needs to modify it! With USE Together, you can work remotely with your teammates on the very same machine. All they need is a device connected to the Internet… and nothing else! Pretty awesome, right? USE Together enables you to simply share your screen with your team (colleagues, collaborators, friends, customers, etc.) and gives them access to your desktop. If someone is making trouble on your desktop, don’t worry, you can quickly take back the control. Your teammates can interact with all your applications, write whatever they want, watch videos with you and many other things. Your computer becomes a real collaborative workplace. USE Together can be used for everything and brings you a more intuitive working experience to create amazing things. User-friendly interface: The application includes an easy-to-use contact list. You can manage your contacts: add a new contact, know when they are available or not, send text messages, voice chat and start a session with them with just one click. 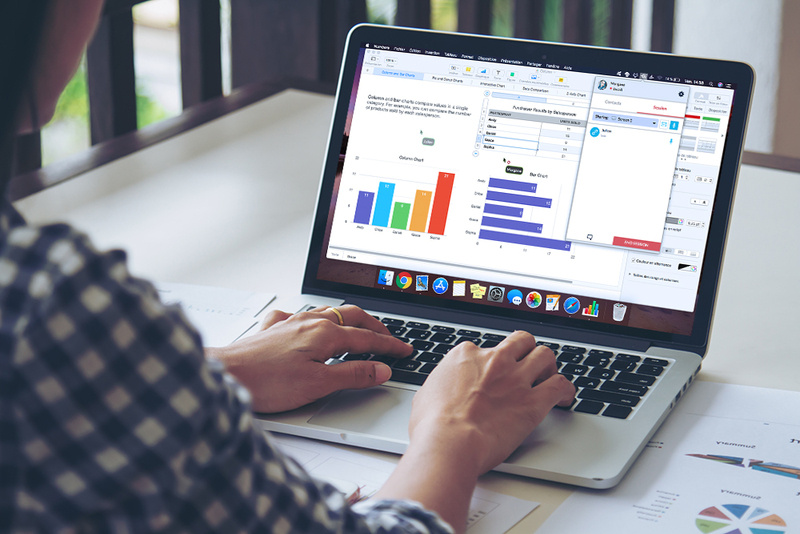 Multiple mouse cursors: After starting a session, you and your team can see what you’re doing all together on your desktop in real time thanks to the multiple mouse cursors system. That’s even better than if you were sitting at the same desk, right? Messaging zone: Communication is the best way to improve the quality of your collaborative work. During a session, you can therefore communicate with your team by sending them instant messages. You can send messages to just one of your contacts or to your whole team during a session. You also have the ability to send files to your team. Audio chat: For a more natural way of communication, you can also directly talk with your team in real time! With USE Together, speak with your team to drive easily your session and guide your teammates in the best way without being physically next to them. Web Browser access: If your teammates don’t want to install the USE Engine app or to subscribe, don’t worry, we also have a solution. Your team can indeed access your session through a simple web browser. Note that USE Together is compatible with the most popular ones: Google Chrome, Mozilla Firefox, Opera and Safari 11+. Share what you want: You certainly don’t want your team to see your private files during a session. You can share just one app instead of your whole screen if you prefer: graphics editor, IDE, presentation software, videos, email and so on. Swap: Quickly take the presenter role with the Swap feature. If your teammate is sharing their screen, you can in turn share yours with just one click. Low latency: USE Together supports hardware encoding to offer you a low latency experience. No more 5 FPS screen sharing sessions, you can watch videos with all your team in real time! Privacy Aware: USE Together respects your privacy and ensures the protection of your data. Indeed, 95% of the screen sharing sessions are made through a P2P (peer-to-peer) architecture, with no gateway between the shared screen and the clients accessing it. The last 5% are when a restrictive firewall or NAT configuration prevents a direct connection: in this case, our own relay servers are used as gateways but the communication can still only be decrypted on each end. Thus, we cannot see anything even if we wanted to. You can install USE Together on both Windows and Mac devices. You can use it for your personal activities, for your studies or even for work. USE Together was designed to meet all your needs! Get started with USE Together! First of all, to start a session on your computer (as the presenter), you need to download and install USE Engine, available for both Windows and Mac users. All USE Together features are available with the USE Engine app. The app also allows you to easily get in touch with your teammates, partners or customers. Through a web browser, you can only join an ongoing session but you can’t start a session. After installing USE Engine, you have to create an account. To do so, all you need is an email address. After signing in, you’re all set to start your first session. Now you’re ready to start a session on USE Together. You can invite whoever you want. There are three different ways to invite people on your screen: directly in USE Engine, by sending them an email or with a simple link that you can copy and paste. USE Together is also ideal to pair remotely with a colleague who has already USE Engine installed on their machine, you can invite them from your contact list, they will join you on your screen directly from the app. You want to invite someone else on your ongoing session? You can add someone during a session through the app. With USE Together, you can also send a request to join your screen to people who don’t have USE Engine app installed. You can either invite them by entering their email or simply copy and paste the link to your session. They will then be able to join your screen directly through their web browser. Once you start a session, your team can do anything on your desktop. Don’t worry though, you can easily take back the control of your screen whenever you want. Now that you’re ready to try USE Together, you can download it here! Follow us on Facebook, Twitter and Reddit. We are pleased to announce that USE Together 2.0 is now officially out. USE Together is a collaborative screen sharing solution enabling you to share your screen with all your team in real time. Back in 2015, Screenhero, famous collaborative screen sharing tool, was acquired / bought by Slack. Two years later, there was no other standalone tool to pair effectively. Screenhero was fully shut down last December after integrating some of its features in Slack. Last year, we launched USE Together, only available on Windows at this moment. Initially created for professionals needing to collaborate on remote desktop environments, we finally decided to release it to everyone. We also released a Mac version in closed alpha few months later. We took a different approach to what Screenhero was and before it was shutdown. USE Together is now available in beta for Windows and Mac! This new version offers you many new features to improve your screen sharing experience. With the previous version of USE Together, we offered a simple way to join a screen through a web browser without having to download anything nor having to subscribe to anything. Although joining someone’s screen on a web browser is pretty cool, but the experience can be limited as there are many things that just cannot be done with it, mainly for “security” reasons (hello alt-tab / cmd-tab). We heard you and make our best to improve your user experience. We are glad to introduce our new user interface. 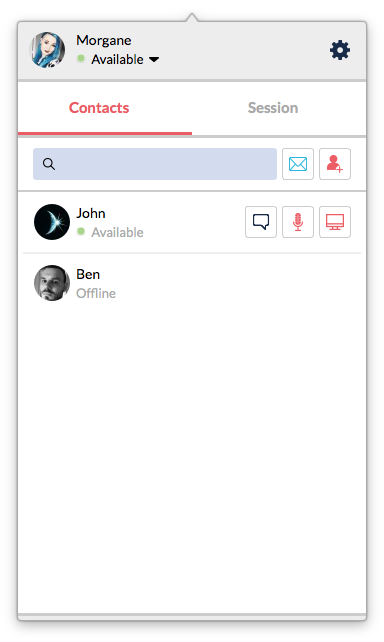 From now on, you can invite your team to join your screen directly from your contact list. 🙏🏻 Thank you for all your support! First of all, we thank you for helping us to improve USE Together. You were many to send us very valuable feedback. We have heard you and we decided to rebuild USE Together, to bring you a better experience. We aim to make it the best pair programming and collaboration tool in the world! With USE Together 2.0, when you share a screen with your contacts, they’ll receive an invite and they’ll be able to join you directly from the app, without having to launch a web browser. All keyboard combos are now supported. We build a new feature in USE Together version 2.0. You can now swap at anytime the presenter role and thus who shares their screen / app. 💻 Also available on MacOS now! USE Together 2.0 is available on Windows and MacOS for everyone. If you’re a Linux user, don’t worry ! Windows and MacOS users will still be able to invite linux people with a link through a web browser. We have totally revamped USE Together with a brand new UI to bring you a new, smoother collaborative experience with all the features above. If you have any questions or if you want to send us feedback, don’t hesitate to contact us at [email protected].